Typed on the 30th of May, late morning. I slept some last night! Napped for a little before calling Kim and my parents, then went to sleep and got a good 7 or 8 hours rest, only woke up 4 times, and once it was raining! Now I’m up and trying to spruce up the room. It’s become a disaster of luggage, shopping bags, and papers in the passed day. Also there are tiny ant-like things crawling on my computer screen and it’s kind of annoying. Today’s pretty relaxed. It’s 10am and Morris said he’d be here in an hour or so, so I’m going to read and maybe play games on my computer or something. But! You can see more of my room! 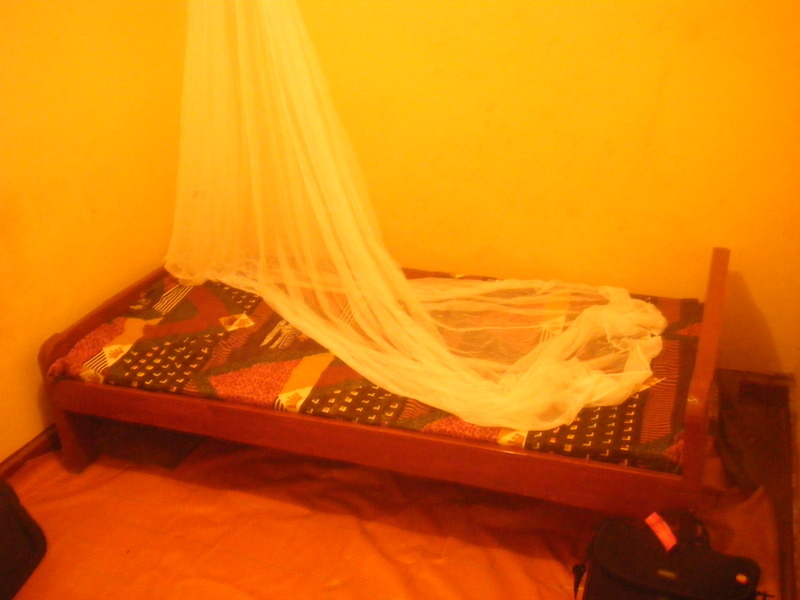 This is my bed, equipped with mosquito net!This is my big iron door. when I leave I have to reach my arm through that little door and lock it from the inside! How was the set up for the mosquito net? Was there already a place to hook it? I’m glad I made you buy it, if only for my peace of mind. :) Don’t forget to take your malaria pills!